I’d spent two months on Haad Rin beach as an eighteen year old, returning home with psychedelic green hair, significantly less grey matter and enough UV jewellery to light a small Norfolk village. But this time I was coming to Koh Phangan to chill out, meditate and perfect my downward dog and The Sanctuary sounded like the perfect place to do it. It was going to be less Rave on, more Rave Om. Tony also loved The Sanctuary. I met him as I walked onto the boiling sand of Haad Rin, sweaty and tired after a jolting, sleepless night on the train from Bangkok. ‘Are you going to The Sanctuary too?’ he asked excitedly, as we waded through the warm shallows on to the waiting long-tail boat. ‘I’ve been there a month already, you’ll love it.’ Four other grubby backpackers hauled their rucksacks onto the rickety vessel and we were off, the clattering diesel engine churning through the translucent waters of the Gulf of Thailand. Fifteen minutes later we rounded the rocky headland of Haad Tian, a narrow strip of golden sand backed by coconut palms and thick jungle, the resort’s huts just visible through the trees. If there was such a thing as the Talking Olympics, Tony would be a dead cert for gold. By the time the wiry boatman steered us into the bay’s shallows we’d heard his entire life story; a seamless, unedited torrent of half-sense spewed out in a jittery, cockney whine. He spoke so rapidly it was a biological marvel he hadn’t passed out. He’d acted alongside River Phoenix during a short career as a child star before becoming a drug-addled car crash of a teenager. He was 42 now, or was it 40, or 31, he didn’t seem sure, and had spent the last few decades drifting between occupations, girlfriends and mental institutions. He’d had a child – or brought up someone else’s child, it wasn’t clear – fallen out with his entire family and been bankrupt at least once. Now Tony ran a window cleaning company in Oxford and was making some coin, loads of coin, enough to spend several months exorcising his demons on this faraway beach. He loved it, never wanted to leave. There were so many lovely people. The Tension Release Exercise was amazing, I had to try it. It would change my life. Did I need somewhere to stay? I could have his bed in the dorm if I wanted since he was moving into a hut tonight to throw a massive party. I should come: it was going to be incredible. Why do I always attract the nutters? I thought, as he turned to Marlene Dietrich, NASA, anthropology and alien-life forms. By the time I dropped my rucksack at reception I was ready for some serious therapy myself. There were lovely things about The Sanctuary: listening to the waves crashing on the beach at night, the howl of monkeys in the jungle, the evening meditation class in the beautiful Buddha Hall, post-meditation gin and tonics, thrashing a new Austrian friend at Bananagrams. But after three days there I mostly wanted to escape. I wanted to get away from the small, dirty beach whose golden sand was strewn with depressing amounts of plastic rubbish. I wanted to escape from the endless self-involved, egotistical conversations about Zebedee’s latest colonic, Hawk’s former drug addiction and the progress of Botox woman’s ten-day fast. I wanted to get away from the unsmiling, lithe limbed hippy clichés lounging on the Thai cushions with their Macs and iPhones, talking about me, me, me, me, me – all so busy gazing at their own navels they couldn’t see beyond. And I wanted to escape from Tony, who buzzed around like some unswattable gnat, telling anyone within ear shot a variation of his muddled story. After the tenth time of hearing it I was even more uncertain of how old he was, or how many children he had. At night he lay in the dorm bed opposite me, clutching his rucksack to his chest as if clinging to the last bit of flotsam in his shipwrecked life. If there’s one thing The Sanctuary’s good for, it’s making you feel sane. I did meet some fellow gin-swilling cynics at The Sanctuary, chief amongst whom was Jen, and on Day Four the two of us made a daring escape to Why Nam. Only five minutes’ walk from The Sanctuary, Why Nam was, as the Thais say, same same but different. Wooden shacks cascaded down the jungly hillside to a tiny, idyllic half moon bay and a breezy open-air restaurant was strewn with reclining stoners. But in some intangible sense it lacked the oppressive, intense energy of its neighbour; there was no chat about fasting and colonics, no hatchet-faced women drinking spirulina shakes and no sulky English receptionist. Sipping fresh coconut juice on a pair of giant beanbags at the far end of the beach, we felt like extras in Escape from Yogabore. Soon after arriving we were approached by a small, muscular man and two bronzed, giggling nymphets. Between them they held a wooden sign chalked with the words: ‘CACAOSUAL SATURDAY, ceremonial cacao, maca, vanilla, rose, stevia, love & magic. Go on a journey with chocolate.’ There was something about the man’s oiled torso, bald head and ball-crushing silver hot pants that was screamingly Italian, a suspicion confirmed the second he opened his mouth. The girls – Americans – were of similarly indeterminate sub-middle age, jangling with bells and shells, the taller of the two shimmering in a silver ball gown. ‘Hey girls’ drawled the older nymphet. ‘Come and join a cacao ceremony in our cute little coffee shack.’ She pointed up the beach to a flimsy lean-to under the palms. ‘It’s being led by an awesome shaman, she’s really experienced’ added the other one, sweating in the silver gown. Minutes later Jen and I were sitting cross-legged around a low table with the Italian (who’d now added a pink wig to his outfit), the two nymphets, a blonde, vacant looking English girl and the suspiciously young American shaman. Last to join us was Darren from Leicester, whose lean, tattooed body was minimally covered by a fetching arrangement of coconut shells, palm fronds and hibiscus flowers. ‘It’s for the party at Eden tonight’ he explained, taking a cup of the steaming hot chocolate. ‘This is sacred Guatemalan cacao’ said the shaman reverently, ladling out the last of the drink ‘used by the Mayans and the Aztecs to commune with their gods.’ It was going to be an intense, heart-opening experience, she told us, a journey into our inner souls; some of us might feel stimulated, others mellow – the cacao spoke differently to everyone. We just had to sit, drink and wait for the wisdom to wash over us. In the meantime we’d take turns to hold a multi-coloured wizard’s stick and tell everyone how we felt. I live in St.Werburghs, Bristol; a wonderfully alternative community of tofu-welding hippies where dreadlocks, camper vans and vegetarian shoes are the norm. I’m not averse to the odd bit of yoghurt-weaving and crystal healing. But holding the wizard’s stick made me feel awkward and clammy, an affront to my buttoned-up British genes – so I mumbled something about the energy on Why Nam and quickly passed it on. Guinevere, the vacant blonde, her Britishness blunted by a winter in Ko Phangan, loved the stick. Off she went, gushing about love, her heart chakra, how cacao had changed her life, her love for the shaman (the two of them were holding hands and crying now). When the cacao hit me several minutes later, she was still going strong. In all the excitement of Darren’s coconuts, the wizard’s stick and Guinevere’s gushing, I’d forgotten about the cacao. It was only hot chocolate after all; I hadn’t really believed it would do anything. But now my body surged with an amphetamine buzz and I couldn’t listen to Guinevere a minute longer. I had to get up, get out of here, get into that perfect blue sea. Jen had the same reaction, and for the next hour the pair of us tore up and down the bay like athletes in training, only feeling normal again hours later. If the cacao gods were trying to send me a message, I’m not sure what it was. As my Bangkok Airways turbo-prop banked over Koh Phangan a few days’ later, I looked down at the golden dots of Haad Tian and Why Nam. They looked so small, fragile and gorgeous, the whole island no bigger than my hand at the window; it was hard to imagine all the micro-dramas being played out down there. I wondered if I’d ever go back, and if so, whether I’d feel any differently about it. Paradise, after all, isn’t a place, it’s a state of mind. 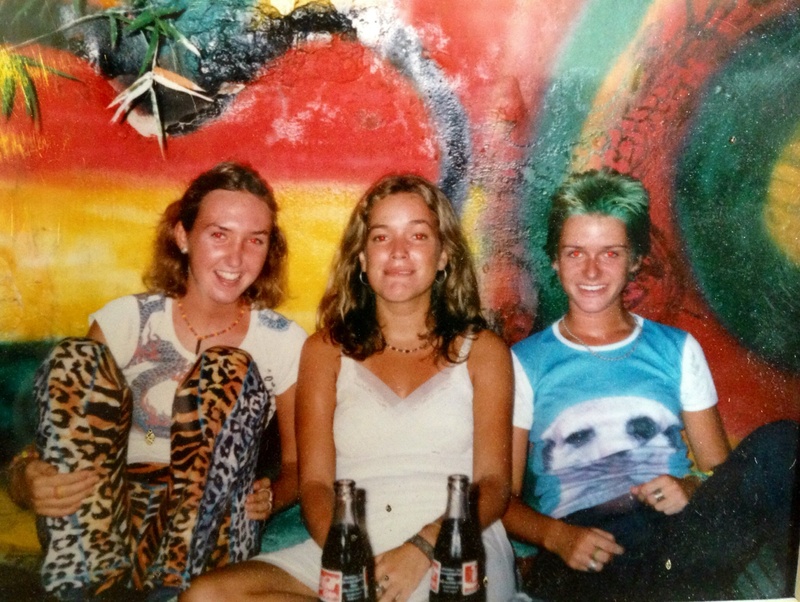 With my friends Anna and Lisa in Thailand, 1998.